Strong, sharp opening with pepper bomb on the palate. Soon wood and molasses tame the pepper but never really subdue it. Sharp nose blow – not recommended. Little complexity, all the flavors remain. This is touted as very strong and it delivers. Puff after puff, without lessening intensity. Unusually good burn and acceptable draw. for Antano. 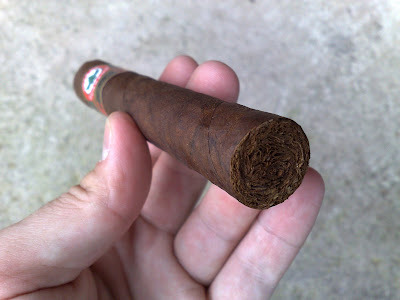 I ought to mention I have had construction issues before, mentioned in the Joya de Nicaragua Celebracion. review. Firm, solid barrel, very good construction. 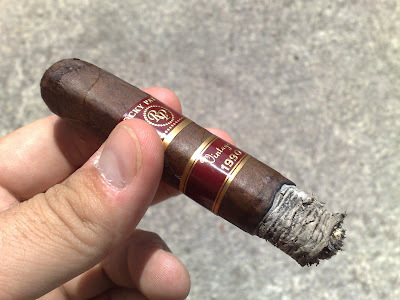 The cigar takes a beating but does not overheat easily. Very peppery and strong. Molasses persist. Very heavy on the palate with long, long, peppery, woody finish. The strenght went beyond scale, but still not what I would consider harsh. Tolerable for those of us, who enjoy a generous kick. Palate at this point coated with molasses, pepper and wood – almost like tasting a young rum. Finish is very long, so eating something or brushing is advisable soon, otherwise you are left with aftertaste even the next day. 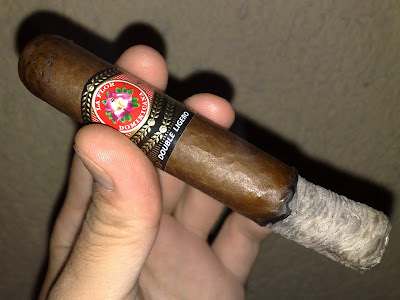 This is one of my go-to smokes, if I can`t decide what to smoke. It is strong, bold, tasty smoke that delivers. My beef with Antanos and Celebraciones is crooked burn and tight draws, so I try not to go above 48RG, plus keep tabs on RH. 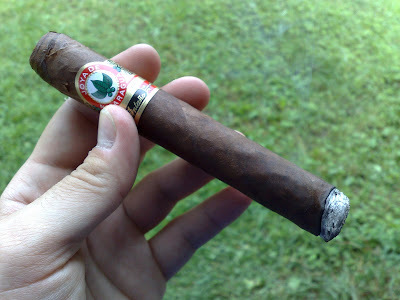 This belicoso performed well, due to lower humidity I have been experimenting with. In Europe, we tend to go lower than 70/70 widely recommended for storing our smokes. 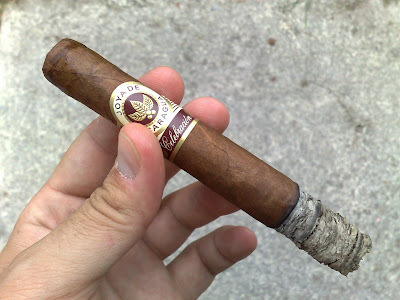 English even practice about 60-60%RH for better long term aging their Habanos, which is what I tried, at around 62%. It works, at least short-term. 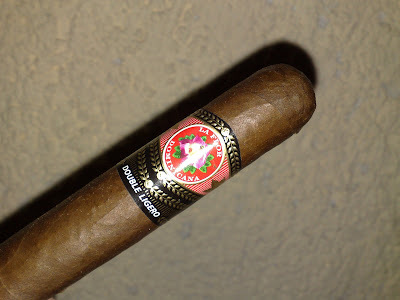 Now, Cubans are not Nicaraguans, tobacco is different, though both can be really excellent, so I will see what this RH does to these smokes down the road in a few years. Upon light greeted by cedar, with earth and spice in the background. Not particularly strong. After a few puffs leather becomes dominant. Nose blow spicy but not harsh. Funky metallic finish on palate – sort of citrusy with some wood. Definitely on the sour side. 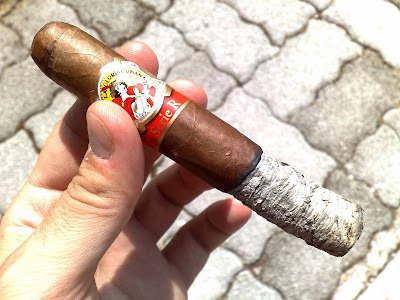 Great burn with very compact ash. Leather, cedar dominate as vanilla notes emerge in the background. Leaves palate dry. Metallic finish persists along with citrus. Medium body. Nearing final third, vanilla is all but gone only hints are left. Wood becomes the center stage, finish remains. Body firmly planted in medium. 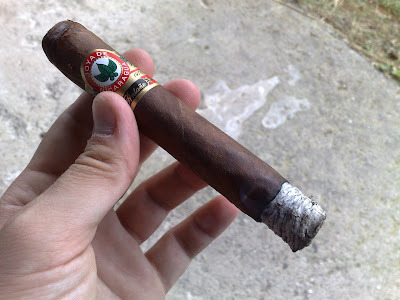 The smoke became somewhat bitter with black pepper notes and tobacco. No tar build-up visible, nicely fermented tobacco. The body moved to medium-full. Right now, I am on a box of these, having smoked 2. They are good smokes, tasty and consistent. Buuut, my decision on the box came about from a couple of samples from different sizes that were infinitely better than these two. Those were strong, really strong, with even greater complexity and pronounced coffee present along with cedar, black pepper, vanilla and baking spice. Maybe these are still a bit young. I will sample the rest of the box at about one a month to see if they improve. AFTERTASTE: funky something woody, nutty?? Unsweetened cocoa on opening with toasted nuts and aged tobacco from the get-go. Very little spice, if any. Easy nose blow, picked up nutty nuances. Only mild-medium body. At the start of this third dark earth begins to show, with nutty flavors taking a backseat. Easy smoke, but not remarkable. Barely medium body. Great draw with nice chocolaty aroma, abundance of smoke. Smooth on the palate. Not very complex smoke, the flavors are consistent. Body gained to solid medium, although touted full on Cuban Crafters website. Slight licorice is evident on the palate. Dark earth persists with some funky taste I can`t put a finger on – tangy, metallic, moisty... but definitely charred wood beneath. Long finish – eat something or go brush. To me, this is an everyday, average but quality smoke. If I lived Stateside, I would probably have a box on hand for everyday or buddies, but since I hail from Europe, with all the shipping costs, plus killer taxes it is not feasible for me to buy a box. I can get similar taste profile at my tobacconist for much less dough and save the cash for something more special. Opens with pepper, the cayenne variety, hot, but at the same without any harshness whatsoever. After a quarter inch, earth and leather introduce themselves, with citrus and fruit notes underneath, plus a hint of salt and some sweet spice is detected on the palate. Nose blow peppery, but not unpleasant at all. Smooth all around. Smooth is the operating word here. S-M-O-O-T-H. 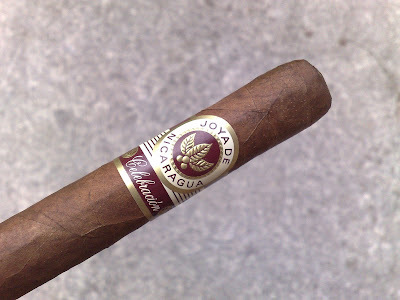 Very strong cigar, but it sneaks up on you, it`s not in your face power. Great pepper, spice, earth and leather just dance on palate with the awesome raisiny aroma complimenting the whole experience. Nearing the final third, bittersweet wood takes the center stage with previous flavors retreating but still present. 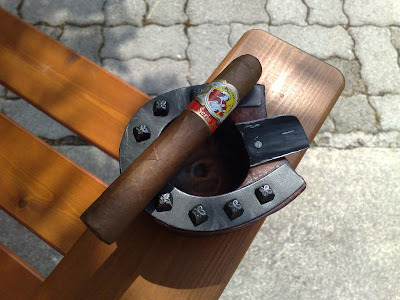 After purging the cigar, again I found fresh fruity and leather flavor, but with pronounced nutty finish – brazilian nuts to be exact. Very full bodied, but not harsh in any way. 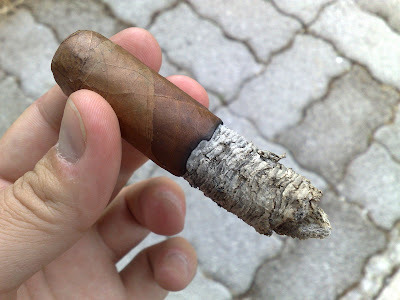 Towards nub some light bitterness creeps up, but not unpleasant – a natural evolution of a burning cigar – waste products and moisture are slowly building up physically near the palate and there is not enough rolled tobacco left to filter these flavors out. Bittersweet wood with bitter finish on top of pepper. This is one helluva smoke. 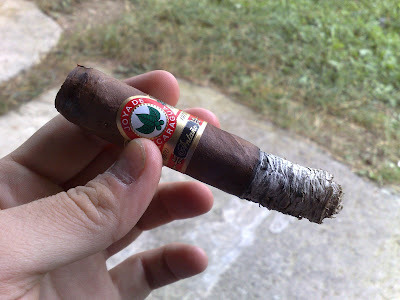 I imagine it`s not very pleasant for a bystander, as the smoke is really sharp, but extremelly aromatic at the same time. It is one of those smokes I would never pair with any sort of spirit – it would most definitely floor me. Cognac, calvados or even rum would be especially good company to this fantastic smoke, but even without, I took a blow to the gut and another one to the head. But it was a very tasty blow. 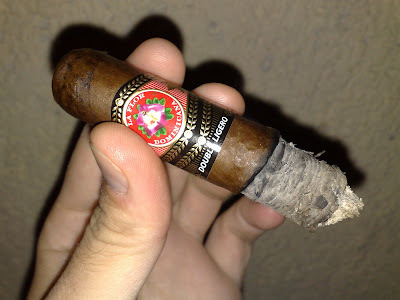 In my opinion, this is the only cigar (at least from the ones I have smoked) that comes close to resembling the ever ellusive Opus X for taste, aroma and strenght. Litto sure knows his stuff. At the outset met with light, natural, non-sweetened cocoa and nicely treated and aged tobacco. No power, pepper or spice, just hints of earth and salt present. Effortless nose blow – just salt detected. Mild to medium body. Very smooth. 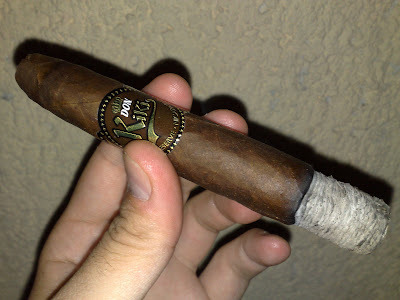 Strangely, considering all the praise this smoke recieves, very little complexity, if any. 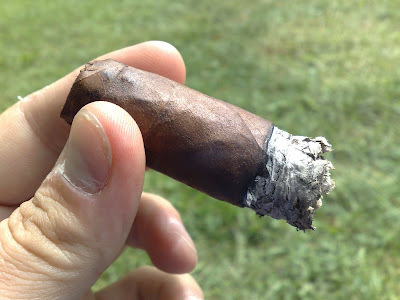 The smoke is abundant, flavors remain unchanged, barely medium body. The burn is even, very thin mascara, with perfect draw. Great aroma of chocolate. Compact but fragile ash. At this point, I am scratching my head. Am I smoking a dud? I had very high expectations for this smoke. Decided to change beverage to Port. 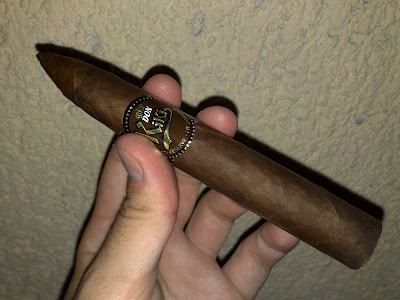 Good idea, as it introduced a whole new set of flavors: dark earth with hint of leather. Salt still in the background on the palate. As expected, no tar build-up. 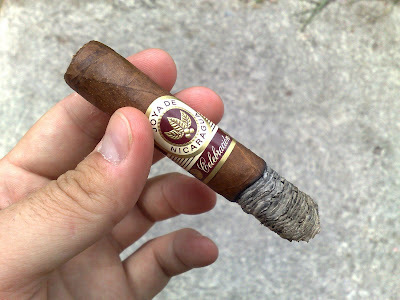 Completely lost head of the cigar and it started unravelling badly, flavors remained from the last third. Finish not particularly heavy. Aside from bad head, which cracked on clip, I cannot help but feel that my palate has been off in this case. I have repeatedly found that milk kills my palate. Have had some milk and cereals for breakfast at about 10 A.M. 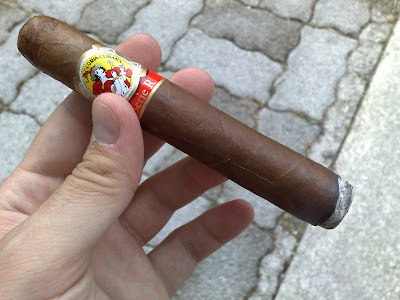 Vacation time allows me two cigars per day and this one was sampled between noon and 2 P.M. 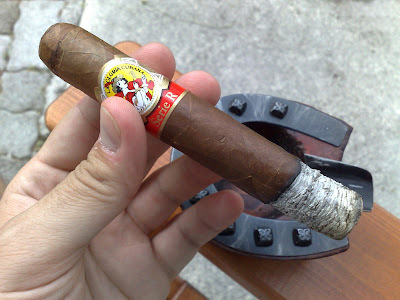 I am certain milk prevented me from tasting all the great nuances reported on this fine smoke. Switch to Port was too little, too late. 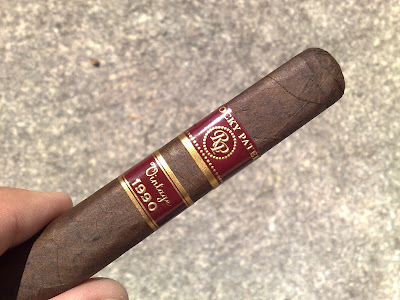 As this was the only smoke I had, the jury is still out for me regarding this Rocky Patel Vintage 1990 Robusto. By the way, does anybody know what is with this 1990 Vintage claim? I suspect only the blend remained the same, plus tobacco used has the same age on it as the original, but all the cigars with original 1990 plant/harvest tobacco are long gone. Very peppery on initial puff. Raw power. After a few puffs, pepper tames and gives way to leather. Very powerfull on nose blow, not recommended. Great burn and draw. Compact ash, but fell just short of an inch. Abundance of cool smoke. Subtle coffee notes present. Very nice flavor mix. Medium-full body. Leather persists with coffee, pepper faint in the background. Some cinnamon pops in and out. Body slowly picking up. Notes of citrus linger on the palate, not unlike grapefruit. Nearing towards final third, the flavor becomes sweeter with wood and molasses taking on ground accompanied with some distant charr. Leaves palate somewhat dry, so have something to drink on hand. Sweet wood dominates on top of slight nutty notes but with real clean and crisp flavors. Finish very short and a bit tangy. Body in the lower range of full. 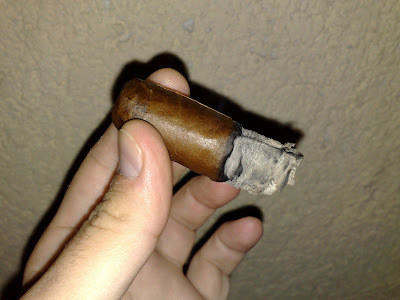 Cigar does not withstand abuse and smokes hot really quickly. No tar build-up visible, nicely fermented tobacco. Pepper returns with charred wood. It irritates the back of the throat. Short finish. I really love this smoke. It is a regular in my rotation. 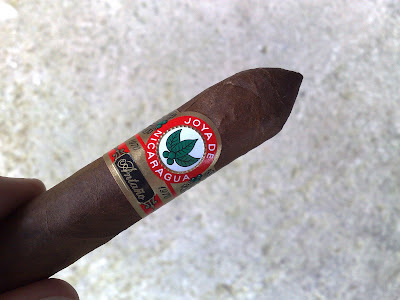 The only bug I very often get from Joya de Nicaraguas, especially Antanos, are the burn issues, especially on larger ring gauges. But I have figured it out, as you can see in the photos. This brand is loaded with ligero, and that means lower RH is desired to keep the cigars in good smoking condition, low 60`s IMO. I started to keep all my cigars in this range and it really shows. No more plugged smokes. 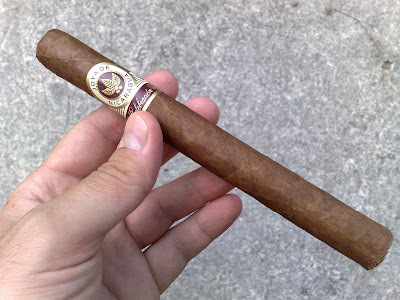 ... my personal cigar blog. 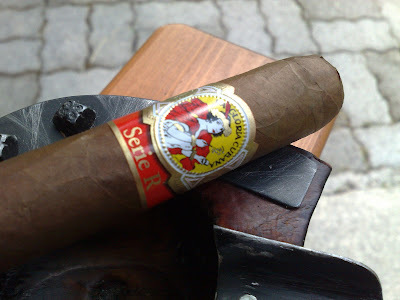 Oh, I can see you scratching your forehead - not another cigar blog!? 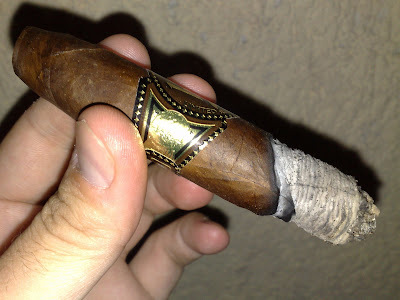 There are a lot of cigar review sites on the Net, some I speed-read daily and really enjoy them. 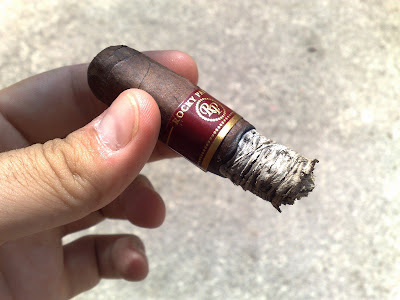 Does the cigar community need another one? I have been thinking about that for some time now. Well, I decided to start one, if for no other reason, my personal enjoyment, as a personal log if you will, of cigars I have smoked and to try and evaluate each experience. 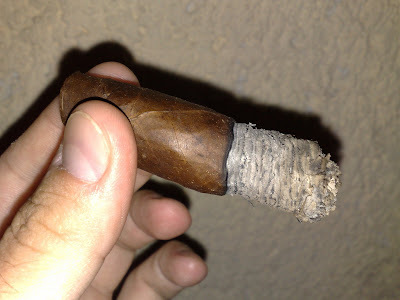 I am far from being an expert, as I have only been smoking cigars regularly for the past 5 years, but have learned a great deal since cutting and lighting my first stogie, and will gladly share my experience with anyone interested. 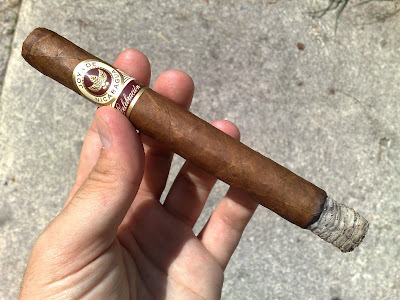 As you will gather from the posts, I am biased towards strong smokes, although I smoke milder cigars as well. This is primarily due to my smoking in the evening or at night when my little boy is asleep, thus I want something to help me unwind, relax and kick me to bed. 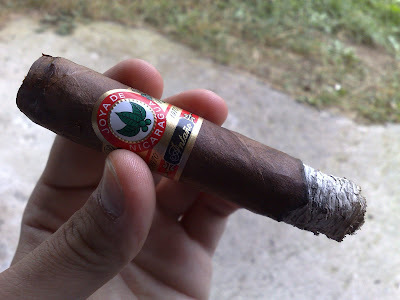 Since cigar smoking is very subjective, I hate rating or grading cigars. Instead, in my postings, I will only observe, note and recommend cigars, based on my experience and the overall performance of the smoke. Sure, I could rate appearance and construction, but more often than not, some flaws do distract in cosmetic sense, but have zero impact on actual experience. Usually, perfectly looking sticks let me down in performance department. 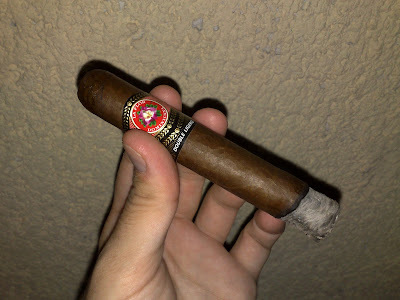 How I evaluate cigars: I have stumbled upon a website of Mr. Rafael Bernardo, a great spanish aficionado, who has attended several Habanos festivals and has even written a book on the subject, THE ART OF UNDERSTANDING AND ENJOYING HAVANA CIGARS. On his website you can find a draft of official Habanos Tasting sheet, presented at the 6th International Festival of Habano, February 2004. Now, I don`t know if it`s outdated, but IMO it pretty much covers every aspect of cigar evaluation. 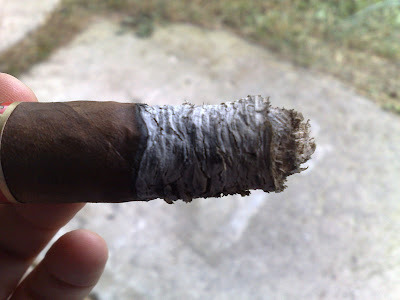 I also comment on cigar performance in thirds plus a nub, as I smoke all cigars to the nub, even if unpleasant, just to see, in which direction the smoke will take me and where it will eventually leave me.